One could spend all his waking hours trying to unsnarl the multiple misconceptions and outright lies about Senator Joe McCarthy that have been spread over the last half century. But since the latest to distort and beat down history appeared in a conservative (on economic and PC issues) newspaper, here we go again. Even on some of the most basic points, a Wall Street Journal op-ed is well wide of the mark. "Fifty-four years ago today [April 22], Sen. Joseph McCarthy started his televised hearings on alleged Soviet spies and communists in the Army," according to former WSJ and Washington Post reporter Ron Kessler. Then the writer inserts a fact. "The spectacle grabbed the country's attention for the next two months." 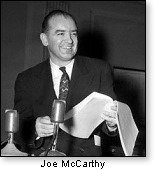 In the first place, the Army-McCarthy hearings, which did begin in April of 1954, were not "started" by Senator McCarthy. They were "started" by his enemies through direct pressure from the White House — in collaboration with the then-Senate Democrat minority — for the express purpose of putting McCarthy on defense, and ending (not starting) his probe of the Army. Officially, those hearings — over which McCarthy himself did not preside — were called to sort out charges and counter-charges between McCarthy and the Eisenhower administration. Ike's people charged that McCarthy and his committee counsel Roy Cohn had pressured the Army to grant special treatment to Army Private David Schine, formerly an unpaid staffer for the Senate committee. McCarthy, for his part, charged that the scenario was the other way around — that the administration, through Army Counsel John Adams and Army Secretary Robert Stevens, had tried to butter up Schine, Committee Counsel Roy Cohn, and — at first — McCarthy himself. The administration's goal in this schmoozing ploy was to lend weight to the ongoing pressure on the senator to drop his investigation of communist penetration of the Army. That investigation — separate and apart from the Army-McCarthy hearings — indeed had been "started" by McCarthy, many months earlier. As noted by M. Stanton Evans in his thoroughly documented Blacklisted by History: The Untold Story of Senator Joe McCarthy, the senator's enemies were well aware of the fact that Senator McCarthy's investigation had hit pay dirt, especially at Ft. Monmouth. Nonetheless, Kessler asserts that in his hearings, "McCarthy failed to substantiate his claims that communists had penetrated the Army." Evans shoots that one out of the water in his chapter "The Moles of Monmouth," wherein he names names — lots of them. Jack Okun — Suspended on loyalty grounds, reinstated by the Pentagon Loyalty Review Board, which on several occasions ignored damaging information on security risks. Barry Bernstein — Accused by Monmouth officials of Red leanings "and outside activities...that made him a security risk." His clearance was suspended a week before McCarthy's hearings. Joseph Levitsky — Used Julius Rosenberg as a reference in applying for his position. Took the Fifth Amendment when asked if he and Rosenberg had been Communist Party members together. Harry Hyman — First at Monmouth, then with a communist union serving Monmouth workers. Took the Fifth when asked by McCarthy about his espionage activities with members of the union. Ruth Levine — In a high position with the lab at Monmouth. Took the Fourth and Fifth Amendments when asked about conspiracy to commit espionage, underground meetings of the Communist Party, and her membership in the Communist Party at the time she was granted security clearance. McCarthy also found evidence of sensitive information at Monmouth ending up in Soviet hands. The Army told him to forget about it — that a Soviet defector who made that claim had since recanted. McCarthy sent his investigator James Juliana — a former FBI agent — to East Germany, where he tracked down the defector who stood by his story and had not recanted. The late Senator Barry Goldwater revealed in his 1979 memoirs that his Democrat colleague Sen. Carl Hayden had told him that when the Democrats regained control of the Senate in 1955, they quietly moved to transfer highly sensitive work that had been going on at Ft. Monmouth to a facility in Arizona. The reason the move was made without publicity, Hayden explained, was that the Democrats did not want to admit that McCarthy was right in his charge that Monmouth was indeed "penetrated." The WSJ piece retreads the tired old myth that McCarthy — in his Wheeling, W. Va., speech in February of 1950 — charged there were 205 communists and spies in the State Department. On the day of McCarthy's Wheeling speech, a local reporter met the senator at the airport. He asked for and got an advance copy. But McCarthy warned Frank Desmond of the Wheeling-Intelligencer that what the reporter was getting was a rough draft and that extensive edits would be made before delivery. Two witnesses have sworn McCarthy did give Desmond that warning. Later, Senate investigators — sent twice to Wheeling by Democrat committees — verified McCarthy's version. The Wisconsin senator recalled that what he had actually said at Wheeling was that there were 57 persons in the State Department "who were either card-carrying Communists or certainly loyal to the Communist Party." That is the crucial half of the story that the WSJ writer ignores. The half that he does include is that before the Wheeling speech, legendary Chicago Tribune reporter Willard Edwards had given McCarthy the 205 figure — on the basis of "more or less a rumor." Edwards was concerned because by then the AP had picked up the misreported Desmond story and sent it to news outlets all over the nation. That half of the story, if accurate, in no way contradicts the other half, clearly indicating that Edwards' pre-speech conversation with McCarthy explains how the 205 figure made its way into the rough draft in the first place (before being dropped prior to his actual delivery). To mention the Edwards half without also recounting the first half qualifies as the kind of half-truth often equated with falsehood. Kessler points out that McCarthy called many more people to testify behind closed doors than were ultimately ordered to testify in public. It is no deep, dark secret that among the very reasons for holding hearings in executive session before bringing witnesses before the public is to make certain no one is unfairly tarnished; also to ensure that people who have little or no useful relevant information to impart, or who could testify only as to classified or highly secret security matters, do not end up becoming part of the public record. This is generally accepted procedure on Capitol Hill. It was not unique to McCarthy. On this matter, the WSJ writer cites as an authority Senate Associate Historian Donald Ritchie. Kessler quotes Richie as saying McCarthy interviewed about 500 people in closed session and called about 300 people in public hearings. This column went back to the transcripts of the closed session hearings of 1953 and 1954, which were released in 2003. I counted only 437 witnesses in that five-volume set of hearings, and that includes many friendly witnesses (roughly 50-75) who either cooperated with the committee or who testified on windup sessions of committee probes that preceded McCarthy's chairmanship, or who appeared in connection with investigative hearings chaired by another committee member and over which McCarthy did not preside. Stan Evans says only about 30 of the unfriendly witnesses actually ended up in public hearings. So if McCarthy nails witnesses in public, he's "smearing them" (never mind the evidence). If he questions them behind closed doors, he's conducting a "star chamber witch hunt." Can't win under that scenario, and the senator's critics play the old game of "heads I win, tails you lose." But that — as Evans puts it in his book — is how Joseph R. McCarthy came to be Blacklisted by History.